NEW YORK (AP) -- McDonald's will start selling bags of ground coffee at its restaurants in Canada next month, a move that could spread to other regions around the world if successful. The world's biggest hamburger chain says the ground coffee will be available in the majority of its 1,400 stores by Nov. 8. The packages will weigh about 340 grams (about 12 ounces) and cost about 7 Canadian dollars ($7.04). A representative at the company's headquarters in Oak Brook, Ill., was not immediately available to say whether there were any plans to sell ground coffee in the U.S. But the company filed a trademark for "McCafe" ground and whole bean coffee here last month. John Betts, president of McDonald's Canada, also noted in an interview that McDonald's has a history of taking hit products from specific regions and expanding them globally. The company's McCafe specialty coffees were first offered in Australia in 1993, then worked their way through Europe before landing in the United States in 2009. For now, Betts said the ground coffee will only be sold in McDonald's restaurants in Canada. But he didn't rule out selling whole beans or expanding into supermarkets down the road. "As we evolve and as our customers ask us for more options, who knows? If we continue to grow the category, anything's possible," he said. The move into bagged coffee is new ground for McDonald's Corp. at a time when the fast food chain's growth around the world has slowed. Last week, the company said its net income slipped amid the volatile global economy and tougher competition. Betts said that the strength of McDonald's coffee plays a critical role in fueling the chain's breakfast business. "If you want to be a credible player in the restaurant industry, you have to have a great cup of coffee," Betts said. Beverages have become a key growth area for fast-food companies in recent years, with Burger King adding coffee frappes to its menu earlier this year and Wendy's testing specialty coffee in select markets. And as competitors have edged in on its space, Starbucks Corp. is branching out into areas such as premium juices and the single-serve coffee market. Starbucks operates about 1,100 locations in Canada, while Tim Hortons has more than 3,300. McDonald's introduced McCafe drinks in the country just last year. Betts says McDonald's was "not doing a good job" with coffee in the country, but has started to build a reputation through coffee give-away promotions that familiarized customers with the brand. 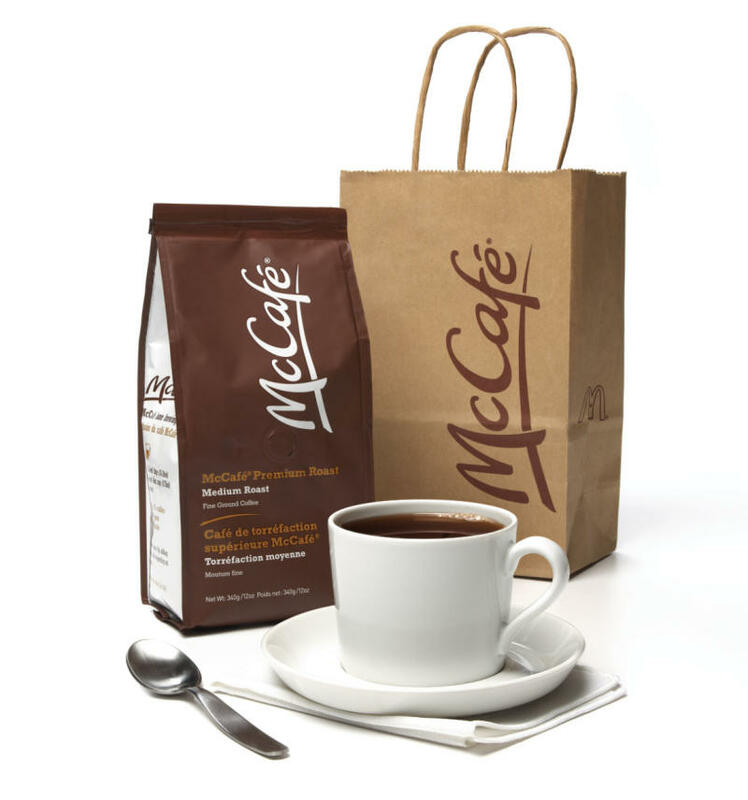 Starting next month, McDonald's customers in Canada who walk up to the counter will see a dark brown bag of premium roast coffee at the counter, with "McCafe" written in white lettering. The bags will be displayed by the register, with an employee fetching a bag from behind the counter for customers who order them. McDonald's has about 33,000 locations around the world. Shares rose 5 cents to close at $87.33.